Something Is Out There...: Did Nettie's Father Follow Her Home? Did Nettie's Father Follow Her Home? Nettie came to the Dec 5 Ghost Walk at Thompson's Park. She has been taking pictures for a little while and the Paranormal intrigues her greatly. A few days later, after visiting her parent's grave in a cemetery not far from her home, she turned and took this picture behind her. She thinks this might be her father following her home to ensure she got there safely. That is such a comforting thought to me. My father would do that for me. I am sure many fathers would if they could. There are a lot of theories about how ghosts can communicate with you. I investigated a house about three years ago in Salem. The lady that lived there bought it from the family of a man named Gerald. He died of cancer in one of the bedrooms in the house. Sandi had experienced several things in her home that made her wonder whether or not she had a ghost. Her husband would see a little old man out of the corner of his eye. She also had experiences with the borrowing phenomenon. One time she put her V8 juice in her fridge and when she went to get it later, it was gone. She asked everyone in the house if they drank and they all said no. Angry and thinking that some one lied about it, she returned to the fridge, only to find the can in there, upside down. We did an EVP session in the kitchen and didn't get anything. But in listening to the recording, I noticed something peculiar. One person asked "Why are you still here?". The very next person asked "Why do you choose to be here?" I think the second question answered the first. Because he chose to be there. So, what am I getting at after all of this? 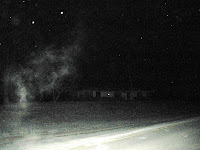 Possibly, a ghost can give you ideas or maybe put thoughts in your head. When I do EVP sessions, I always have every one ask what ever pops into their head for that reason. While the pic above that Nettie sent in might well be her breath, it might just as well be as she thought also. Her father following her home and letting her know it by being in the picture for her to see. We have no way of knowing for sure. Personally, I rather like her idea. What do you think?